This article shows you how to create an Azure Automation account in the Azure portal. You can use the portal Automation account to evaluate and learn about Automation without using additional management solutions or integration with Azure Monitor logs. You can add those management solutions or integrate with Azure Monitor logs for advanced monitoring of runbook jobs at any point in the future. With an Automation account, you can authenticate runbooks by managing resources in either Azure Resource Manager or the classic deployment model. One Automation Account can manage resources across all regions and subscriptions for a given tenant. Creates a service principal in Azure Active Directory (Azure AD). Assigns the Contributor Role-Based Access Control (RBAC), which manages Azure Resource Manager resources by using runbooks. Classic Run As account. This account uploads a management certificate. The certificate manages classic resources by using runbooks. With these accounts created for you, you can quickly start building and deploying runbooks to support your automation needs. To create an Automation account, your Azure AD user account must be added to a role with permissions equivalent to the Owner role for Microsoft. Automation resources. For more information, see Role-Based Access Control in Azure Automation. In the Azure portal, under Azure Active Directory > MANAGE > App registrations, if App registrations is set to Yes, non-admin users in your Azure AD tenant can register Active Directory applications. If App registrations is set to No, the user who performs this action must be a global administrator in Azure AD. If you aren't a member of the subscription’s Active Directory instance before you are added to the subscription's global administrator/coadministrator role, you are added to Active Directory as a guest. In this scenario, you see this message on the Add Automation Account page: “You do not have permissions to create." If a user is added to the global administrator/coadministrator role first, you can remove them from the subscription's Active Directory instance, and then readd them to the full User role in Active Directory. In the Azure portal, go to the Azure Active Directory pane. After you select a specific user, select Profile. The value of the User type attribute under the user's profile should not be Guest. Sign in to the Azure portal with an account that's a member of the subscription Administrators role and a coadministrator of the subscription. Search for Automation. In the search results, select Automation. On the next screen select Create. If you see the following message in the Add Automation Account pane, your account is not a member of the subscription Administrators role and a coadministrator of the subscription. In the Add Automation Account pane, in the Name box, enter a name for your new Automation account. This name cannot be changed after it is chosen. Automation Account names are unique per region and resource group. Names for Automation Accounts that were deleted may not be immediately available. If you have more than one subscription, in the Subscription box, specify the subscription you want to use for the new account. For Resource group, enter or select a new or existing resource group. For Location, select an Azure datacenter location. For the Create Azure Run As account option, ensure that Yes is selected, and then select Create. 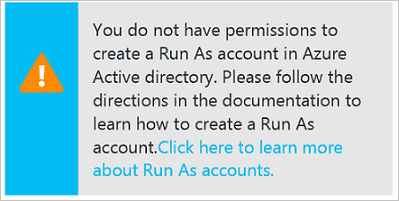 If you choose not to create the Run As account by selecting No for Create Azure Run As account, a message appears in the Add Automation Account pane. Although the account is created in the Azure portal, the account doesn't have a corresponding authentication identity in your classic deployment model subscription or in the Azure Resource Manager subscription directory service. Therefore, the Automation account doesn't have access to resources in your subscription. This prevents any runbooks that reference this account from being able to authenticate and perform tasks against resources in those deployment models. When the service principal is not created, the Contributor role is not assigned. To track the progress of the Automation account creation, in the menu, select Notifications. When the Automation account is successfully created, several resources are automatically created for you. After creation, these runbooks can be safely deleted if you do not wish to keep them. The Run As Accounts, can be used to authenticate to your account in a runbook, and should be left unless you create another one or do not require them. The following table summarizes resources for the Run As account. AzureAutomationTutorial Runbook An example graphical runbook that demonstrates how to authenticate by using the Run As account. The runbook gets all Resource Manager resources. AzureAutomationTutorialScript Runbook An example PowerShell runbook that demonstrates how to authenticate by using the Run As account. The runbook gets all Resource Manager resources. AzureAutomationTutorialPython2 Runbook An example Python runbook that demonstrates how to authenticate by using the Run As account. The runbook lists all resource groups present in the subscription. AzureRunAsCertificate A certificate asset that's automatically created when the Automation account is created, or by using a PowerShell script for an existing account. The certificate authenticates with Azure so you can manage Azure Resource Manager resources from runbooks. This certificate has a one-year lifespan. AzureRunAsConnection A connection asset that's automatically created when the Automation account is created, or by using a PowerShell script for an existing account. The following table summarizes resources for the Classic Run As account. AzureClassicAutomationTutorial Runbook An example graphical runbook. The runbook gets all classic VMs in a subscription by using the Classic Run As Account (certificate). Then, it displays the VM names and status. AzureClassicAutomationTutorial Script Runbook An example PowerShell runbook. The runbook gets all classic VMs in a subscription by using the Classic Run As Account (certificate). Then, it displays the VM names and status. AzureClassicRunAsCertificate A certificate asset that's automatically created. The certificate authenticates with Azure so you can manage Azure classic resources from runbooks. This certificate has a one-year lifespan. AzureClassicRunAsConnection A connection asset that's automatically created. The asset authenticates with Azure so you can manage Azure classic resources from runbooks. To learn more about graphical authoring, see Graphical authoring in Azure Automation. To get started with PowerShell runbooks, see My first PowerShell runbook. To get started with PowerShell workflow runbooks, see My first PowerShell workflow runbook. To get started with Python2 runbooks, see My first Python2 runbook.